Semtech Corporation (Nasdaq: SMTC), a leading supplier of analog and mixed-signal semiconductors, today announced its LoRa® Wireless RF Technology is a key enabler of a new low power, wide area network (LPWAN) being deployed in Japan by SoftBank Corp. (“SoftBank”), a subsidiary of SoftBank Group Corp. (TOKYO: 9984). Japan’s LoRaWAN™-based network is expected to deploy during Softbank’s 2016 fiscal year and service Internet of Things (IoT) industry sectors, which can benefit from an intelligent sensing infrastructure for collecting and analyzing data to help make business decisions. The LoRaWAN-based network is comprised of hardware, software and services from Actility and Hon Hai Precision Industry with Semtech LoRa Technology embedded in the sensors and gateways. The new network is initially expected to provide services for IoT applications such as equipment monitoring and control at commercial facilities, buildings, warehouses and other venues, automated gas and water meter reading, tracking for senior citizens and children, monitoring highway and railroad infrastructure, and managing of logistics and fleets of cars, trucks and buses. 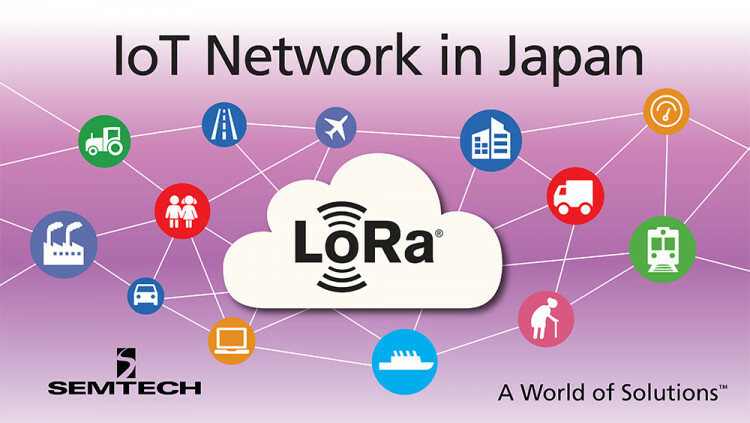 Semtech, Actility, Hon Hai Precision Industry and SoftBank are members of the LoRa Alliance, a group nearly 400 companies committed to driving and enhancing the LoRaWAN specification to ensure interoperability and scalability of LPWANs and IoT applications. Through its work with member companies and IoT industry groups, it is making LoRaWAN the standard for LPWANs focused on low-power, long-range IoT applications. To date, there are LoRaWAN public and private networks in more than 50 countries worldwide. Low Cost: LoRa reduces upfront infrastructure investments and operating costs, as well as end-node sensor costs. Standardized: LoRaWAN ensures interoperability among applications, IoT solution providers and telecom operators to speed adoption and deployment. All statements contained herein that are not statements of historical fact, including statements that use the words “will,” “is expected to,” “look forward to,” “to establish” or other similar words or expressions, that describe Semtech Corporation’s or its management’s future plans, objectives or goals are “forward-looking statements” and are made pursuant to the Safe-Harbor provisions of the Private Securities Litigation Reform Act of 1995, as amended. Such forward-looking statements involve known and unknown risks, uncertainties and other factors that could cause the actual results of Semtech Corporation to be materially different from the historical results and/or from any future results or outcomes expressed or implied by such forward-looking statements. Such factors are further addressed in Semtech Corporation’s annual and quarterly reports, and in other documents or reports, filed with the Securities and Exchange Commission (www.sec.gov) including, without limitation, information under the captions “Management's Discussion and Analysis of Financial Condition and Results of Operations” and “Risk Factors”. Semtech Corporation assumes no obligation to update any forward-looking statements in order to reflect events or circumstances that may arise after the date of this release, except as required by law. Semtech, the Semtech logo, LoRa and LoRaWAN are registered trademarks or service marks of Semtech Corporation and/or its affiliates. Third-party trademarks or service marks mentioned herein are the property of their respective owners.